Using radio buttons allow selecting one option from many in HTML forms. While using Bootstrap form, it is quite easy to create radio buttons with Bootstrap classes. By using your own style or third party plug-ins, you may also create beautiful looking radio buttons. In this tutorial, I will show you simply using Bootstrap to create radio buttons along with plug-ins to style it beautifully. In this demo, a simple page is created with radio buttons. A group of three radio buttons is used that uses the radio class (by Bootstrap). The class is used in the div while input type radio is used inside the label tags. Make sure including the Bootstrap CSS file in the <head> section. By using the radio-inline built-in class in the label tag, that contains the input radio, you may create the inline radio buttons. In this demo, the same set of radio buttons is used as in above example. You can see all radio buttons are inline. Instead of the label, you can also use span tag there, however, the user won’t be able to select an option by clicking on the text. 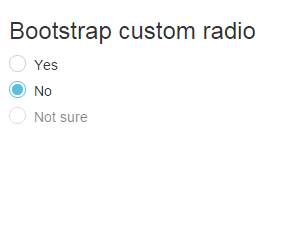 The custom styles can be added to the Bootstrap radio buttons. I will show you a few demos by using the third party small plug-in, awesome-bootstrap-checkbox, which is just a CSS file. You may see the difference between the first and this example. If you look at the code in this example, it is using an additional class in the radio’s div elements. After that, you just need to refer these classes in the radio div elements, e.g. This style file is given by the maker and can be seen here. By using this file, you can create nicely styled radio and checkboxes for your web pages. See another example of radio group in a form by using this CSS class. Note: In above example, I only included build.css file. However, to use the checkbox as well, you have to include font file as well. For text boxes, I used a custom CSS file which is placed in the head section as well. 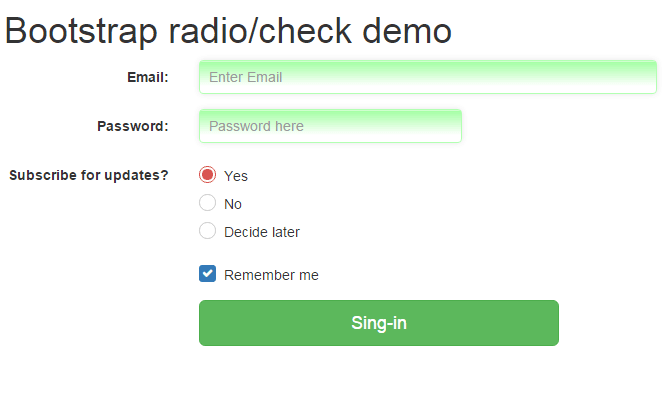 You may also create beautiful switches based on radio button using Bootstrap framework. The switches allow the users selecting an option with nice user interface. You can see a few in the figure below. Then you may use this nice plug-in. For complete details of creating switches based on radio buttons and checkboxes, go to this tutorial: Bootstrap switches.